For many cyclists wintertime is a time to relax, take some time off the bike and away from targeted training before rebuilding their fitness in more favorable conditions. Others will endure long hours pedaling indoors at a spin class, in the gym, on a trainer or rollers while occasionally braving the slushy roads, frost heave and freezing temperatures for the simple pleasure of riding outside. Some will hang up their Sidis and pick up a pair of skis or snowshoes, venturing into the frosty backcountry for some exercise, exploration and enjoyment of winter’s beauty. For those riders who prefer to get their two-wheeled jollies in the woods rather than on pavement the winter has always been a mandatory off-season and the long wait for trails to dry out after the snow melts can feel like an eternity. 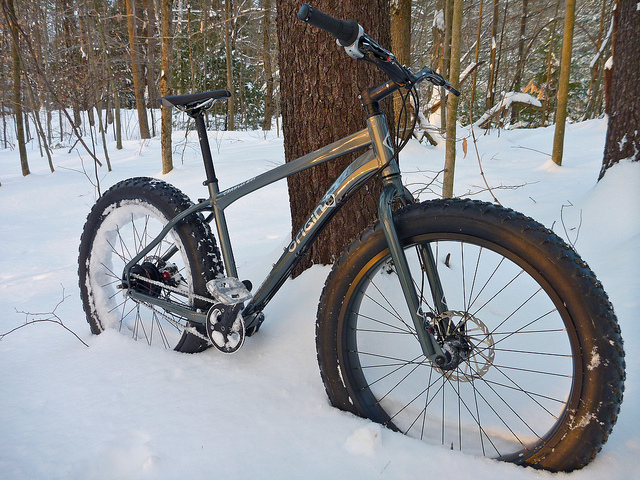 Spurred by the frustration and pent-up need for fat-tired fun, the recent advent of the fatbike has changed the complexion of winter in a significant way. 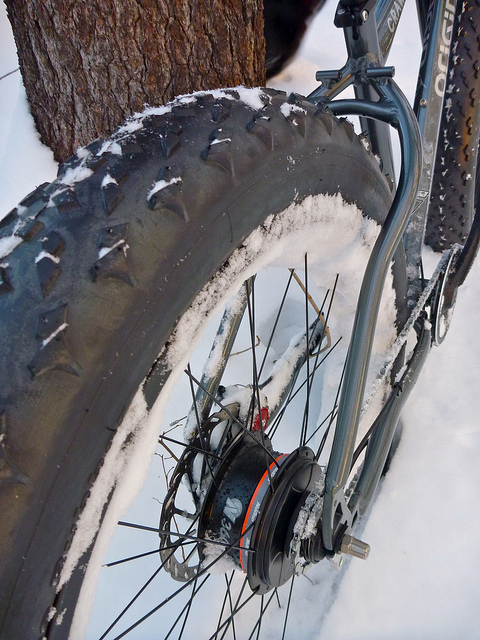 When Surly introduced their Pugsley – the first mass-produced fatbike – in 2005, it seemed like a novelty to many. Its absurdly wide, 26 x 3.8” tires looked silly and cumbersome. What could this bike really do? Then adventurous riders started testing the capabilities of these bikes and discovered whole new worlds of previously inacessible terrain and conditions were now within reach. Sand, snow and any other loose, slick or soft conditions where narrower tires would sink or loose traction all became rideable on these human-powered ATVs. Since then, fatbikes have become more and more common and more riders have discovered the possibilities that their Sasquatch-sized footprints can open up. However, the expense of these specialty setups has kept many riders away. Although the cost of category-defining bikes like the Pugsley or Salsa’s Mukluk has come down, the price of entry into the fatbike world has always been relatively high compared with entry-level road or mountain bikes. However, Origin-8 recently brought the financial barrier down a notch with the introduction of their new Crawler, a well-equipped fatbike that retails for under $1,500, less than half the price of some higher-end offerings. The Crawler’s frame is built from shaped and manipulated 6061 aluminum. The top tube arches at the head tube junction to improve clearance for the extra-wide fork crown, but most of the other shapes formed into the front triangle appear primarily cosmetic. In the rear however, the aggressively curved chain and seat stays provide ample clearance for oversized rubber while maintaining a reasonably short rear end. The dropouts are rear-facing, horizontal “track ends” to allow chain tension adjustment for internal gear and singlespeed setups but still offer a derailleur hanger for versatility. One set of eyelets are drilled and tapped into the dropouts and a set of rack barrels sits at the top of the seat stays. 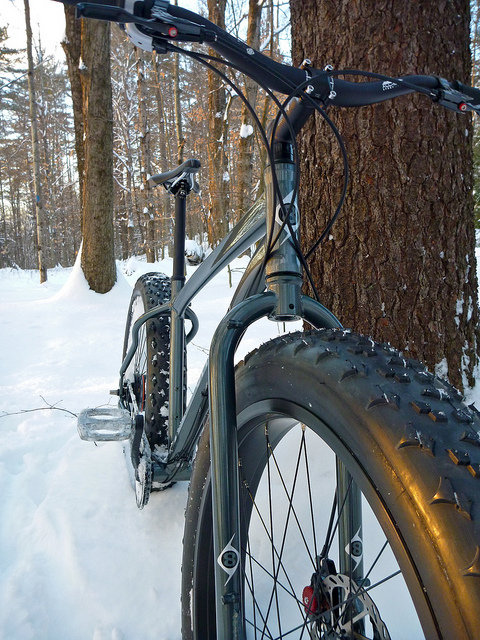 The fork is a cro-mo steel unit with a burly unicrown design and standard-for-fatbikes 135mm dropout spacing. Rack barrels were brazed on at top and bottom to allow mounting of rear-type racks up front. Water bottle bosses are present on the seat and down tubes but not on the fork legs where many frame-bag-equipped fatbikes carry their water. The highlights of the build are – of course – the freakishly wide tires. It is simply not possible to ride this bike down the street without someone commenting, “whoa, check out those tires!” Origin-8’s Devist8er 2 tires feature an aggressive tread for all-condition traction, a 120tpi casing for a supple ride and a kevlar bead to save weight. They tip the scale at the respectable weight of 2 lbs, 14 ounces (1,304g) per tire. Though not light by any other standard this is a very competitive weight for a fatbike tire; more than 300g lighter than Surly’s steel-beaded, 27tpi tires. Mounted on the Origin-8 AT-PRO 80mm-wide rims and inflated to around 10psi they measure approximately 3.8”, a bit narrower than the marked 4.0” width. Despite the slight discrepancy between actual and advertised width, the tires still provide ample traction, cushioning and flotation. Aside from the tires, the other component on the bike that sets it apart is the NuVinci N360 continuously variable transmission (CVT) hub gear. Using similar technology to that found in many new automobiles, the NuVinci hub provides a very wide, seamless gearing range with no clicks or stops. This may sound bizarre and alien but after spending only a few minutes on the system it becomes a very easy, intuitive way to shift; just like adjusting the volume on your stereo or hot water on your faucet. The twist shifter has a very smooth action and tacky grip, making it easy to operate while wearing heavy gloves. The NuVinci is a smart system for a fatbike like the Crawler, not only for its ease of use but also for its reliability in all conditions. With no external gears or derailleur pivots to clog with snow or mud and its completely sealed, maintenance-free internals, the NuVinci should perform flawlessly in situations where traditional derailleur gears fail. The straight run of strong and durable singlespeed chain also eliminates the problem that many fatbikes have with the chain rubbing the tire in certain gears. Happily, braking duties are handled by Avid’s venerable BB7 mechanical disc brakes rather than one of the crop of cheap imitators often specified on budget builds. Despite the recent flood of mechanical disc brakes that have come to market for cyclocross and road bikes, the BB7 still sets the standard for ease of setup, adjustment and stopping power among non-hydraulic systems. Paired with a set of Avid’s SpeedDial levers, the BB7s provide solid braking power and modulation in all conditions. The build is rounded out by Origin-8’s functional but inexpensive house-brand cockpit parts and crankset. None of these components stand out as exceptional but they all do their job and keep the overall cost of the bike down. I was put off by the high-rise handlebars at first but they turned out to provide an optimal position to keep my weight back and the front wheel riding high to surf through deeper snow. However, if one were inclined to trim some excess weight from the bike, the handlebar, stem, seatpost and crankset would be easy places to save grams without spending a heap. Overall, fatbiking is a fun and exciting way to get out and explore the winter woods and bikes like the Crawler help make this world accessible. The extensive networks of snowmobile trails that traverse New Hampshire and Vermont provide an ideal playground for snowy adventures. 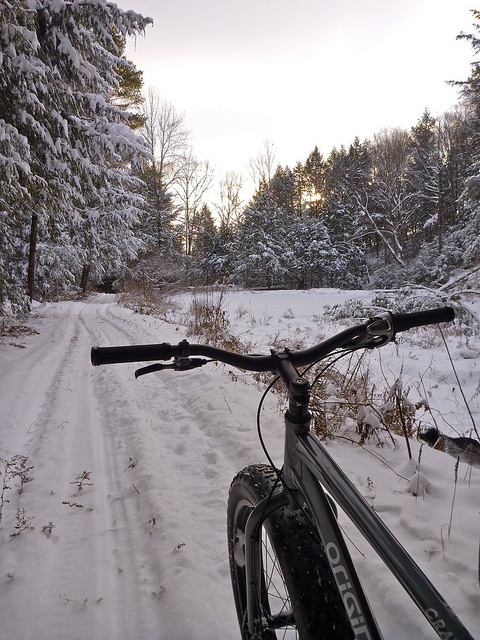 If you’re sick of riding indoors and are ready for a new winter experience come talk to us about fatbikes! Photos by Ryan King. All Rights Reserved.